Pain after knee arthroplasty- we help you! Specialised knee clinic- make an appointment! The first contact with you in my specialised knee clinic "The painful knee arthroplasty" is very important.Here we want to get detailed information about your medical history before and after knee replacement. Hence, it will last at least for 45 minutes without imaging studies. At the end a differential diagnosis should be established. In addition, the initial indication for primary TKR should be revisited. It is well known, that patients with only mild degree of OA or osteonecrosis achieve inferior results than those with a severe OA. A detailed clinical examination is one of the decisive pillars of diagnostics in patients with pain after total knee replacement. 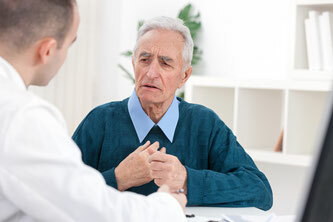 Clinical examination can be divided in inspection, palpation and clinical testing. "The unhappy total knee replacement- a comprehensive review and management guide", which will be published in Springer Publisher, Heidelberg in 2014. 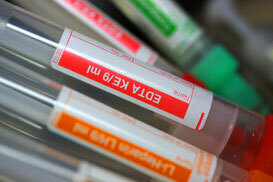 Laboratory investigations are indicated when an infection is suspected. The most important parameters are investigated in the blood such as CRP, leucocytes or procalcitonin). Besides blood, joint aspiration and synovial biopsies should be analysed. 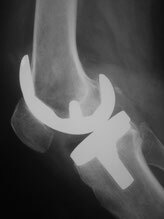 Conventional radiographs (anterior-posteriorer and lateral) are the primary imaging in patients with pain after knee arthroplasty. Diese ist allerdings so grob, dass nur sehr grobe Fehlpositionierungen hier erkannt werden können. An over- or undersizing of the prosthetic components can be identified as well as signs of loosening or wear. Radiographs should always be performed weight bearing. Besided these standard radiographs under some circumstances it is necessary to perform more images in flexion. Stress radiographs are indicated in suspicion of instability. Stress radiographs should always be performed in comparison to contralateral side. One can distinguish between medial-lateral and anterior-posterior stress radiographs. In the image displayed a lateral instability after TKR (insufficiency of lateral collateral ligament) is shown. Fluoroscopy helps to identify soft tissue impingement or more dynamic problems. It is helpful in exceptional cases and should always be performed by the treating orthopaedic surgeon. Ultrasound is a dynamic imaging modality, which is in particular helpful in cases in which tear of the quadriceps tendon or patellar tendon or tears of the collateral ligaments are expected. In CT the position of the knee prosthesis should be evaluated in all six degress of freedom. Measurements is performed for the tibial and femoral TKR components as well as for the mechanical and anatomical leg axis. Currently accurate determination of component position is hardly feasible with conventional methods. For this purpose we have developed a customised software, which allows us to determine TKR component position in a highly accurate manner. For this we were awarded the Swiss Quality Award 2013. 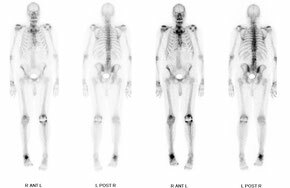 Conventional bone scans as well as 3D scintigraphy (SPECT) has been replaced by SPECT/CT, which is a combination of SPECT and CT.
SPECT/CT combines a 3D scintigraphy (SPECT) with a CT in one imaging modality. 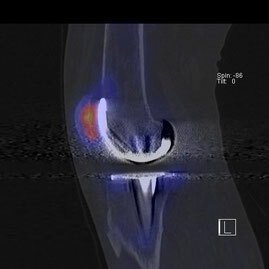 This new imaging offers the chance of combining information on structure, anatomy, metabolism and mechanics of the knee joint. In our own research SPECT/CT was beneficial in diagnosing loosening, infection, patellofemoral problems, over- or undersizing of TKR and malpoistion of TKR. Thus, we have recently included SPECT/CT into our diagnostic algorithm. Till to date over 300 patients with pain, stiffness or instability after knee arthroplasty benefited from the richer source of infomation. 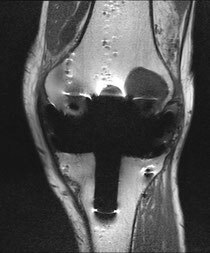 Until recently it was well known, that MRI is heavily altered by metal artifact splatter and hence it is not usedful in patients after knee arthroplasty. However, in the last decade MRI has made significant progress in terms of metal artifact reduction sequences. To date, MRI can be conisdered as adjunct imaging modality in patients with problems after knee arthroplasty. 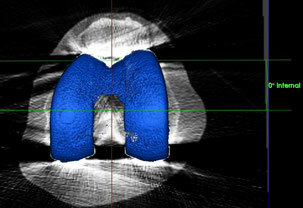 In the image here you see a MRI of a patient with loosening of the femoral TKR component. An aspiration or synovial biopsy from the knee joint is recommended in suspicion of an infection. This should be done in the OR. Cultures and histological investigations help to reveal an infected knee arthroplasty. An allergological work-up can be helpful, if all other diagnostics have not revealed the cause of the patient`s problems or the patient has an extensive allergy history. The work-up should be done by or in collaboration with a dermatologist, who has specialised in terms of metal or cement allergies.